Most people think of the system tray as that tiny space at the bottom right corner of their screen that has the clock and some random other icons. Admit it, it’s not often that you make use of this little widget. And yet, there are several light little apps that can actually make your system tray much more useful than it is now. Here are 12 of the best programs you can download to boost your system tray. This is a useful email notification tool that will save you the bother of opening your mail account to check if you have mail. Whether you use Gmail, Yahoo Mail, Hotmail, or almost any other email service, This app will let you read your mail, reply to it, or forward it, without having to download it from the server. You can add as many accounts as you like without confusion, because each account is indicated by a different color. This app lets you free up space on your taskbar, and hide what files you have been viewing on your system, by allowing you to minimise your your open windows to the system tray, which is hidden until clicked upon. If you like, you can altogether hide your system tray, containing all your minimised folder, so rubberneckers can only guess what you are working on. Even more of a space saver than the 4t program is the Minime app, because it lets you minimise all your open files and programs into one single icon. Files can be minimised by simply pressing ctrl+shift+z, and they can be restored by clicking on the icon on the tray and selecting the item in the menu that appears. If you want to share files and pictures on the net without hassle, FluffyApp is the tool for you. Simply set up an account free of cost with CloudApp and download this app on to your system tray. Now you can drag whatever file you want shared to this little icon, and it will automatically be uploaded on CloudApp, which generates a URL that can be shared by mail or social network sites. This app can tell you exactly how much space you have left on your hard disk, simply by hovering your mouse over the icon for a second. It gives you an exact figure and a percentage, so that you can be prepared if you are running out of space. The menu lets you choose which drive you want to check, including removable drives. If you’ve been working overtime on your computer, it may be time to give it a thorough check up, and this software does just that. Simply by clicking the icon, you can find out your disk’s error rate, how long it’s been working at at a stretch, its temperature, and much more. You can also activate an icon that will display your machine’s temperature at all times, so that you know when to take a break. Since most laptops don’t have light indicators showing whether Numbers lock, Caps lock, or Scroll lock, this is a helpful little tool that will let you avoid wasting time and making mistakes. Three icons will be added to your system tray that will let you know at all times what your lock status is. Now you don’t have to rush to the run window or open an excel sheet every time you have to do a calculation. This software adds a tiny calculator to your system tray. Apart from simple arithmetics, you can use hotkeys to convert decimals to fractions, or calculate square roots. The results are automatically copied to your clipboard, for pasting where you need them. If your computer is working slower than usual, the problem could be that you are running short of memory. Download this cunning little app to find out how much physical and virtual memory you are using up. Right clicking will let you see which programs are hogging the maximum memory, and will let you run the defragmenter. Isn’t it irritating how you have to minimize every single window in order to access the Recycle Bin? 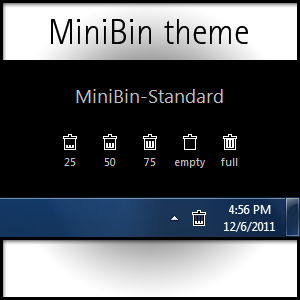 With the MiniBin app, you can drag your files to the icon on the system tray and they will be erased instantly. The best part is that you can customize your system tray recycle bin to look just the way you want it. If you use Google Docs to share files with your friends and colleagues, this notifier program is an answer to your prayers. It lets you know when new documents are added to the service, and also when a user edits an existing document. Double click the icon on the system tray to see the list of unread documents, and double click any item to open it on Google Docs. With all the apps you downloaded from this list, your system tray probably looks like a cluttered mess by now. This software is just what you need to organize and declutter your tray. You can customise which icons you want to see all the time, and which you want to see only in case of a notification.